As natives obtained more firearms in the 17th and 18th century, killing large animals became easier, however, as the demand for hides by the Europeans and the desire/need for trade goods by the Indians grew, the huge populations of deer, elk and buffalo were quickly becoming depleted. The continuing wars that the Indians were drawn into required the men to spend more and more time fighting, which left less time to hunt the diminishing herds of large animals, making them even more dependent on the white traders and military for food and supplies. 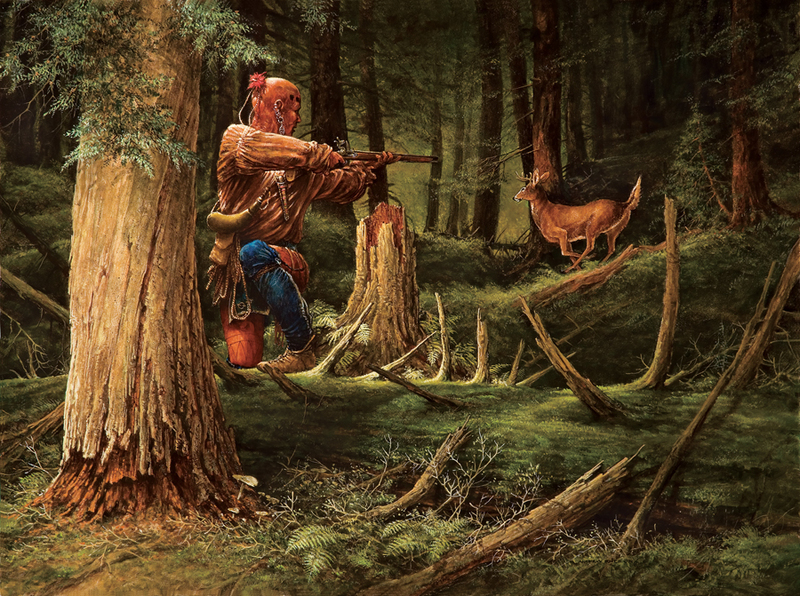 The hunter in this painting has been caught by surprise by the appearance of a fast running white tail deer behind him. He is in an awkward position to fire accurately and he must quickly decide whether to take a chance shot at the large buck. If he is lucky, he will have food, a valuable hide and he will probably recover a much needed lead rifle ball. If he is unlucky, he will have lost valuable powder and a ball, plus he will have scared any other game which may be in the area. What will he decide?